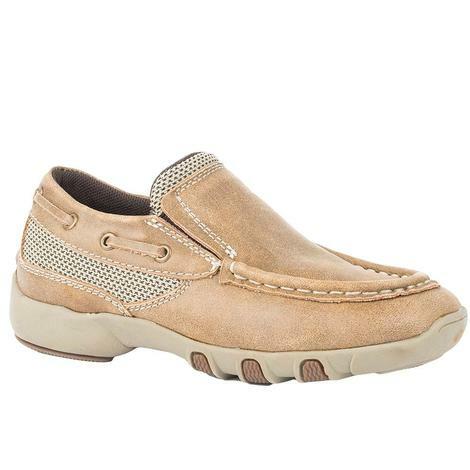 These casual shoes by Roper have a tan vintage leather upper with mesh inserts. 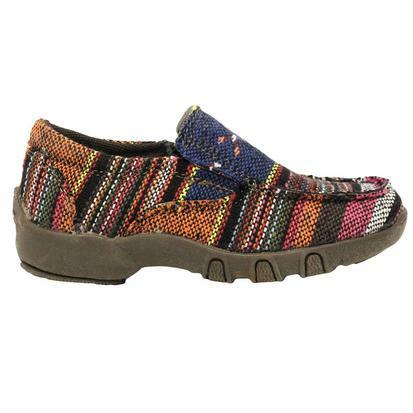 They feature a removable insole, padded collar and moisture wicking lining for comfort, plus a flexible rubber outsole for stability and traction. 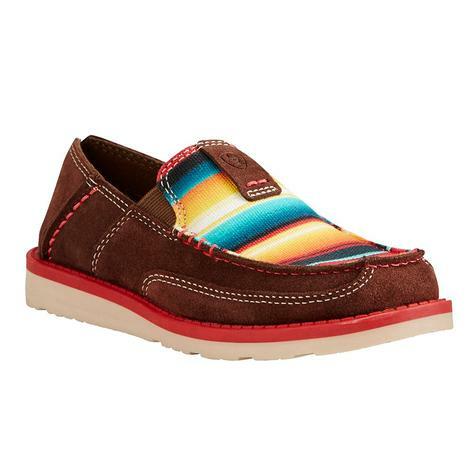 Ariat's Kid Serape Cruiser is the perfect casual shoe for the spring and summer. 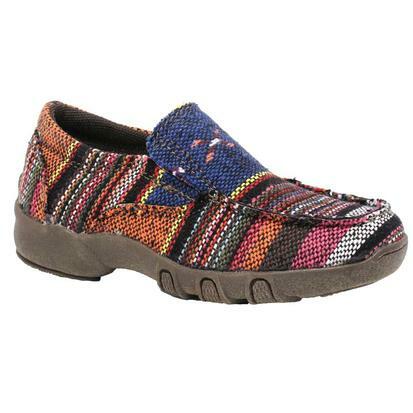 These serape mocs by Roper have a fabric upper with a multicolored Aztec pattern throughout. 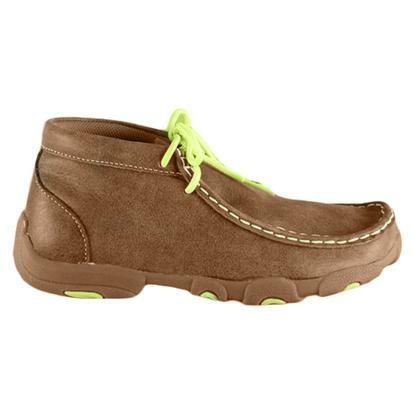 The removable insole, moisture wicking lining and flexible rubber outsole provide lasting comfort throughout the entire day. 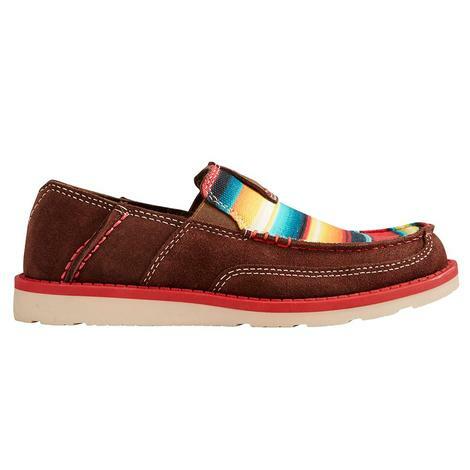 Slip on style. 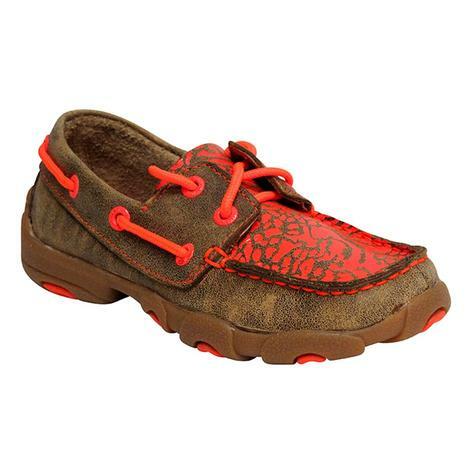 Twisted X Kids' Neon Orange Driving Moccasins loud shoes for loud kids that look great and hold up beautifully. 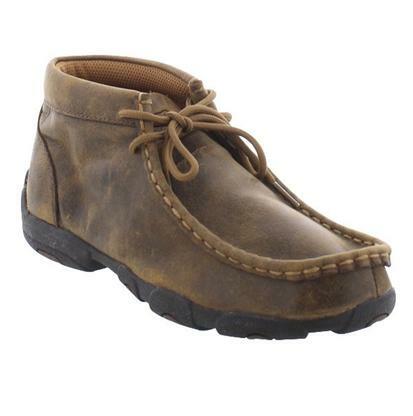 You can always count on Twisted X for kid-proof footwear. 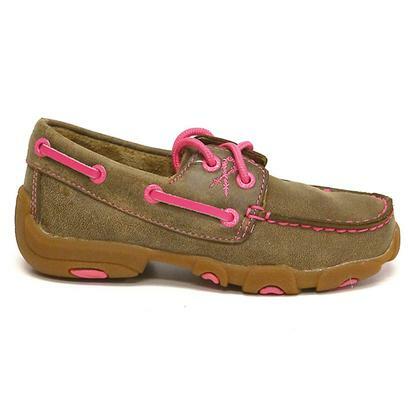 Twisted X Kids' Dusty Tan & Neon Pink Driving Moccasins are a tailor fit for your kiddos. Twisted X make a really great pair of shoes that will double for school as well as the barn, look good and last. 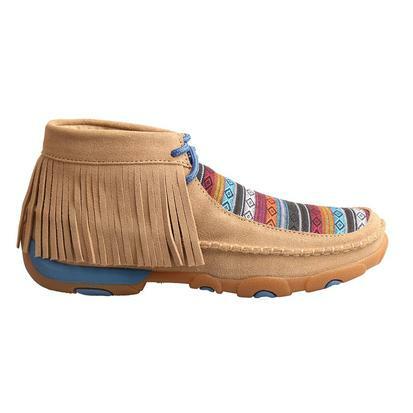 These mocs by Twisted X have a serape pattern throughout with a fringe trim around the top. 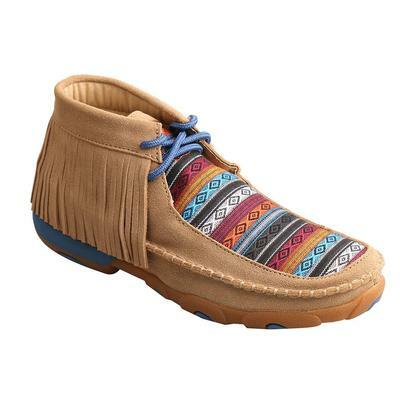 Other features include a moc toe, walking heel, and lace-up closure. 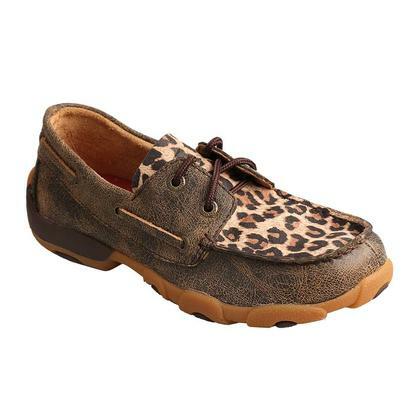 Your kids are going to absolutely love these leopard bomber mocs by Twisted X. 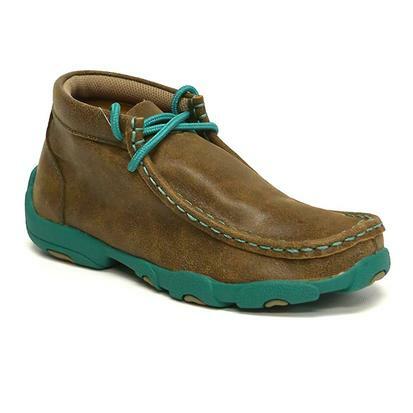 The mocs are easy to slip on and have a genuine super slab rubber outsole. 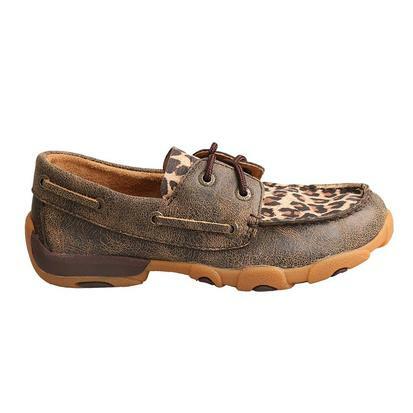 These moccasins by Twisted X have a leather upper with leopard print. 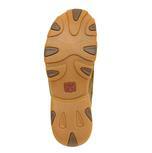 The moc also features a slip resistant rubber outsole. 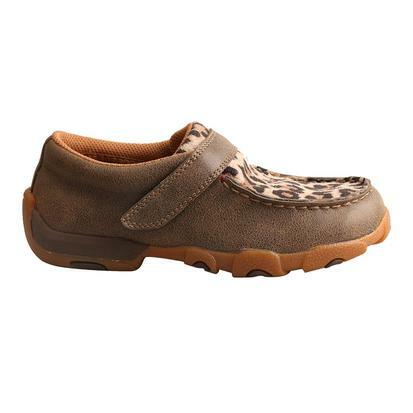 Twisted X Cowkid's™ Boot Collection are made just like the adult Hooey boots, with all of the same wonderful features, but in sizes just right for your little cowboy and cowgirl. These brown leather causals easy to put on, and are great for everyday use. 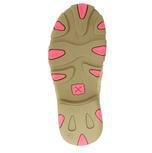 In support of breast camcer awareness - these shoes are for the tough fighters. 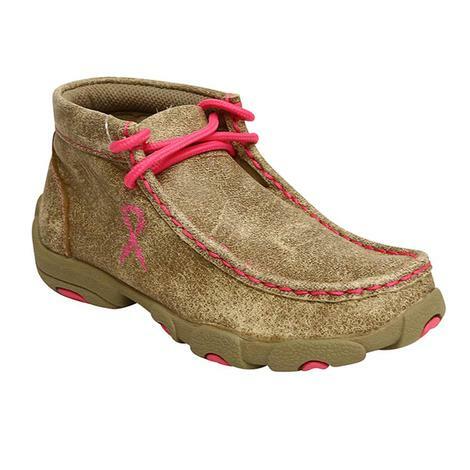 Tough Enough To Wear Pink™ Collection Bomber -Cowhide & Neon Pink Accents -Lace Up -Neon Pink -Breast Cancer Ribbon -Embroidery -Leather Lining -Round Toe -SD™ Footbed -Rubber Outsole -Oil Resistant & -Slip Resistant. 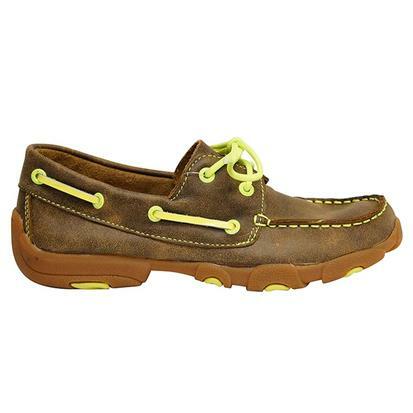 These casual bombers are leather with a lively pop of neon yellow color for flair! 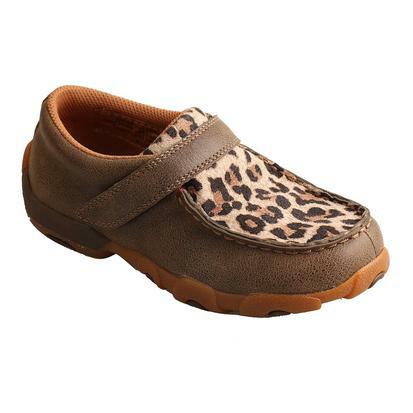 Your kids will love to stand out from the crowd in these great shoes! 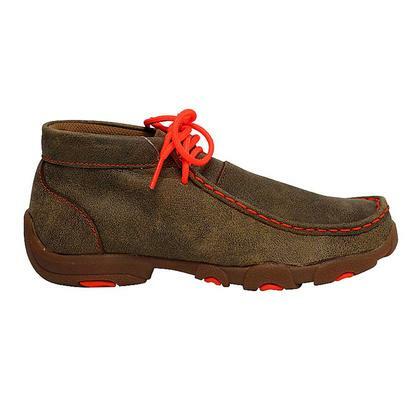 Twisted X Youth Neon Orange Moccasins let you be casual and comfortable as well as dress it up if need be. 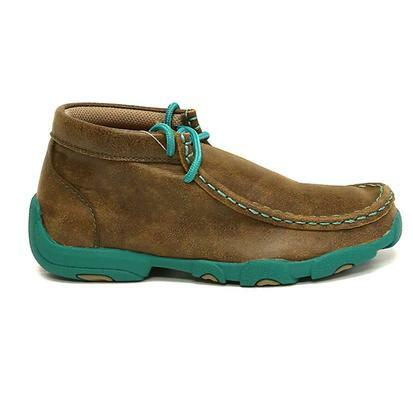 Twisted X always seems to have a trump in the pocket where comfort and style are concerned. South Texas Tack has them. 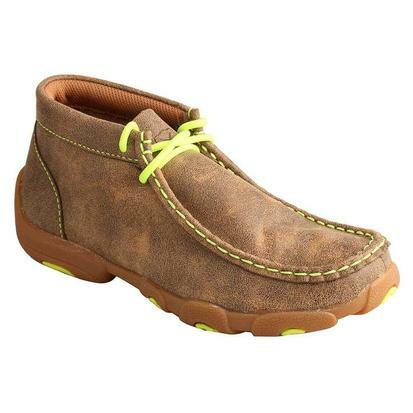 Twisted X Youth Neon Yellow Moccasins are a great choice for good looking school shoes as well as a pair that can go to the stock shows and hold up really well. 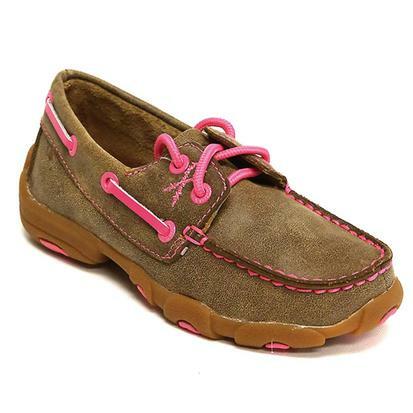 These Twisted X are available in Sizes 11-6 (Whole Sizes Only). 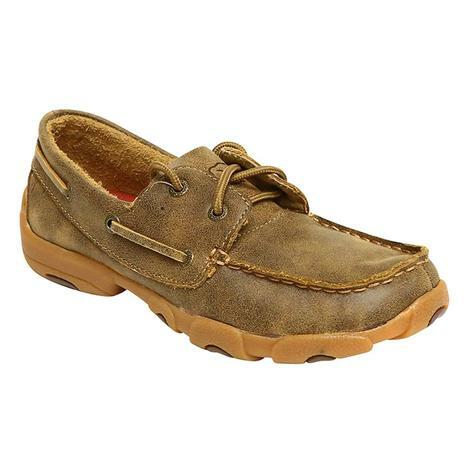 Twisted X Youth Boat Shoes are a fine looking solution to the school shoe that will double for the stock show and functions that need a casual shoe to put under the jeans. Great brown bomber leather with rubber outsoles. 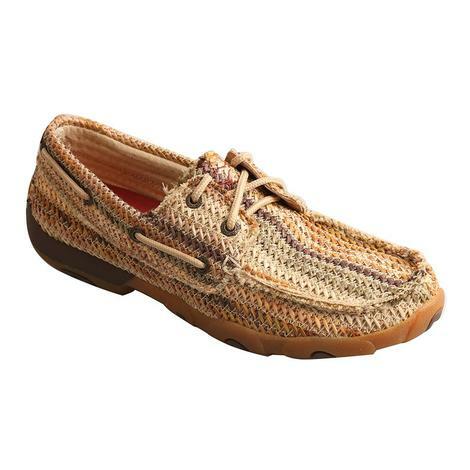 Twisted X Youth Driving Mocs are the answer to all of your kiddo's functions that require a sturdy and great looking shoe that can handle the barn as well as the public function where tennis shoes just aren't gunna cut it. Twisted X comes to the rescue. 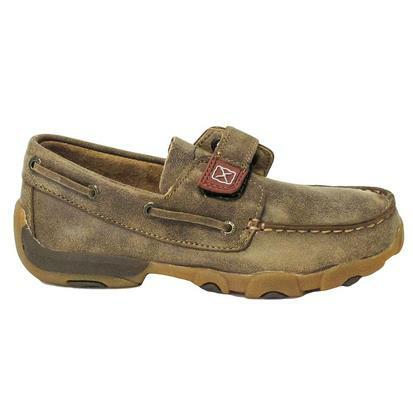 Twisted X Childrens Driving Moc Bombers are soft and supple bomber leather with a great velcro strap to adjust to any foot. 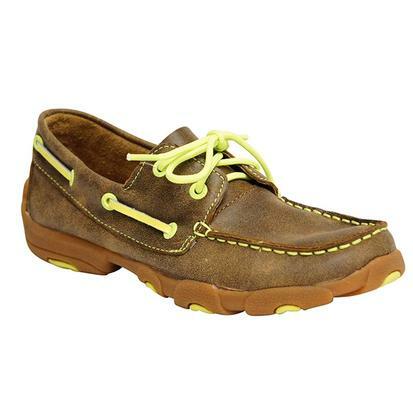 Each pair are carefully stitched and highlighted with leather lacings. 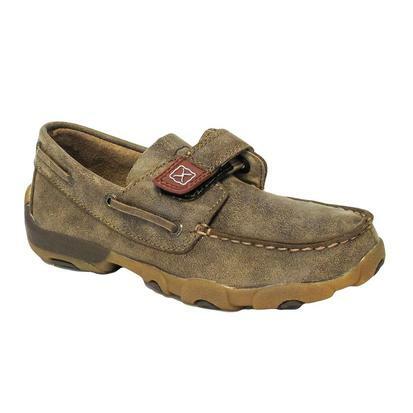 All rubber soles and that great Twisted X leather look in comfortable slip on shoes. 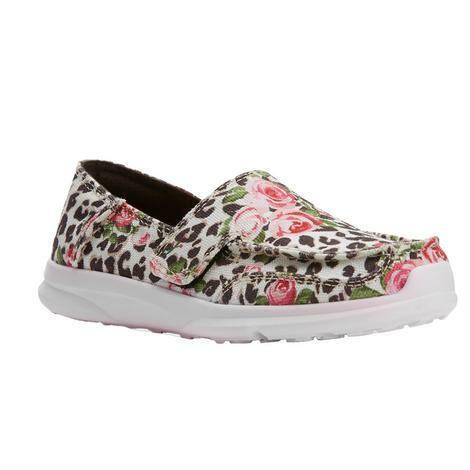 Runs in sizes Sizes 1-6 (Whole Sizes Only). 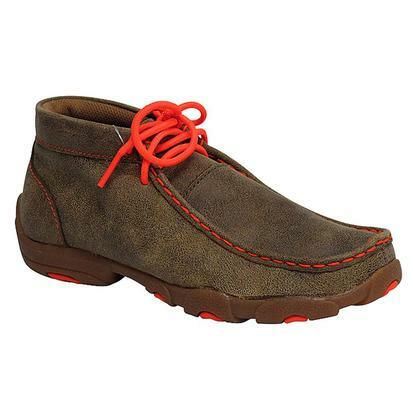 Twisted X Childrens Driving Mocs are the right choice for your kids to work and play in sturdy, good looking shoes. 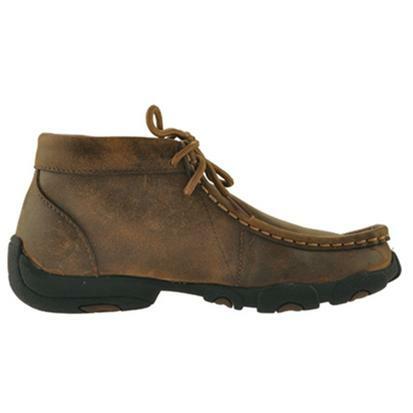 This Twisted X pair is made from tan bomber leather that stands up to the elements and protects with rubber outsoles and great stitching.